This white leather sneaker is one of Gucci's most popular styles, and naturally, one of the most often faked. 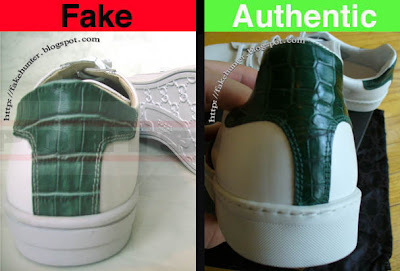 Below are several real vs. fake comparison photos of this style shoe. eBay is flooded with the fake versions so pay close attention to the details. 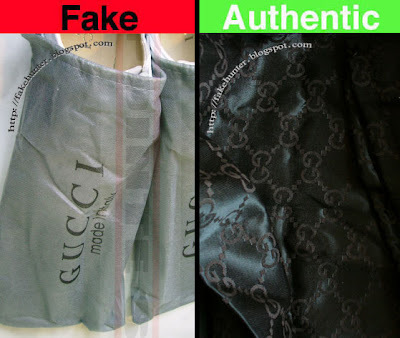 Keep in mind that there are many different fake versions of this style out there so make sure ALL of the details match the authentic examples because different fakes have different errors in the styling. Above are two different comparison photos, with two different fakes. The top fake is a bit more accurate than the bottom one, but they're both easy to distinguish as fake. The bottom fake is missing some stitching/padding on the side and has a different sole. However both of these fakes have many things wrong with them. The fake eyelets are metal instead of the white painted metal as seen on the authentic pair. The red and green stripe should not have any stitching on it and both of these fake examples have white stitching. This red and green stripe should be made out of woven nylon. The fake stripes tend to be wider than the authentic one.. The back of the heel on these Gucci shoes comes up quite high, and most of the fakes out there don't come up as far. Above are two different fake variations. The back of the heel is covered in a green alligator/crocodile embossed leather. In the fake example above the patch is wider and the material features a different scale pattern and coloring than the original. Also note that the authentic version is stitched around the rubber sole and this fake is not. Some fakes are stitched around the sole but with much larger stitches (like one stitch for every three on the authentic pair). The inside of these shoes is made of white leather (not brown like the above fake) and there is an embossed 'GUCCI made in italy' logo inside. In this style shoe the logo is only embossed and not printed. Here is another knock-off variation of the logo. Also note the difference in the size of the lettering and the spacing. A lot of these fakes can also be spotted by the shoe bags that are often included in the auctions. The authentic shoe comes with a dark satin brown GG print shoe bag. 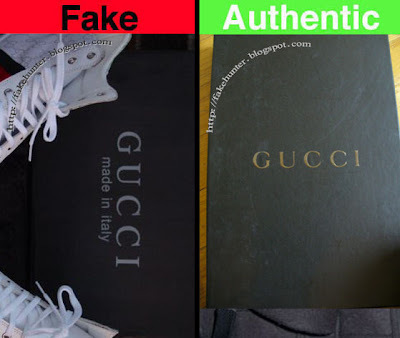 Also get to know what an authentic Gucci shoe box looks like. There are many fake examples on eBay (one of which is pictured above). The real box has slightly raised metallic lettering that runs parallel with the shorter side of the box. However, keep in mind that just because a box or a shoe bag may be real, it never guarantees that the shoes are also real. Always carefully inspect the pictures of the actual product, not just the boxes, tags, etc.